I had a terrific week in Paris but I am glad to be home and in my own bed, with my own pillow. Just nothing like that feeling. 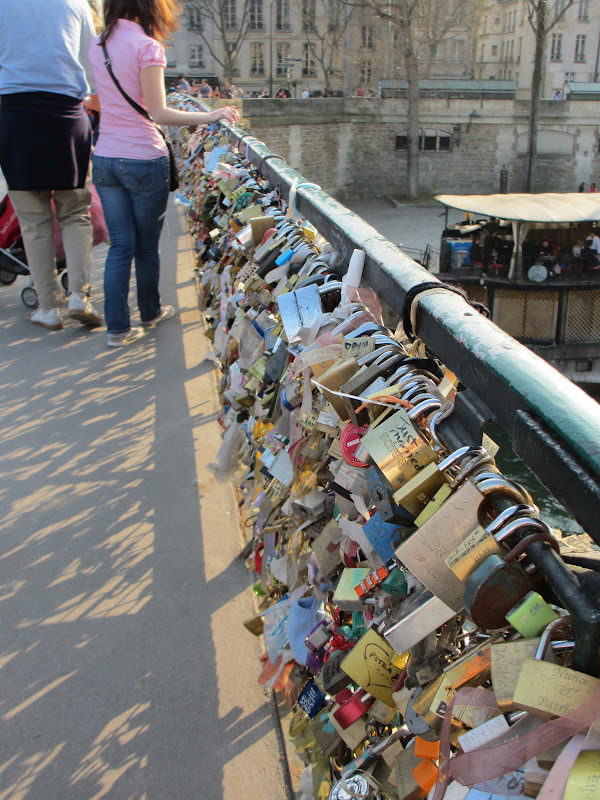 As for Paris, I thought I would tell you about some of my favorite things I saw and did. 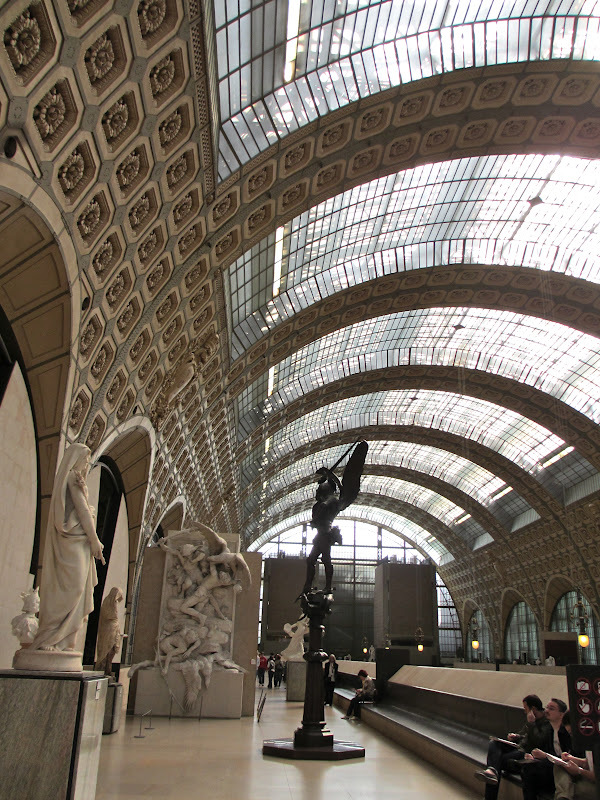 My number one was easily Musee d'Orsay, let me tell you why. "The history of the museum, of its building is quite unusual. In the center of Paris on the banks of the Seine, opposite the Tuileries Gardens, the museum was installed in the former Orsay railway station, built for the Universal Exhibition of 1900. 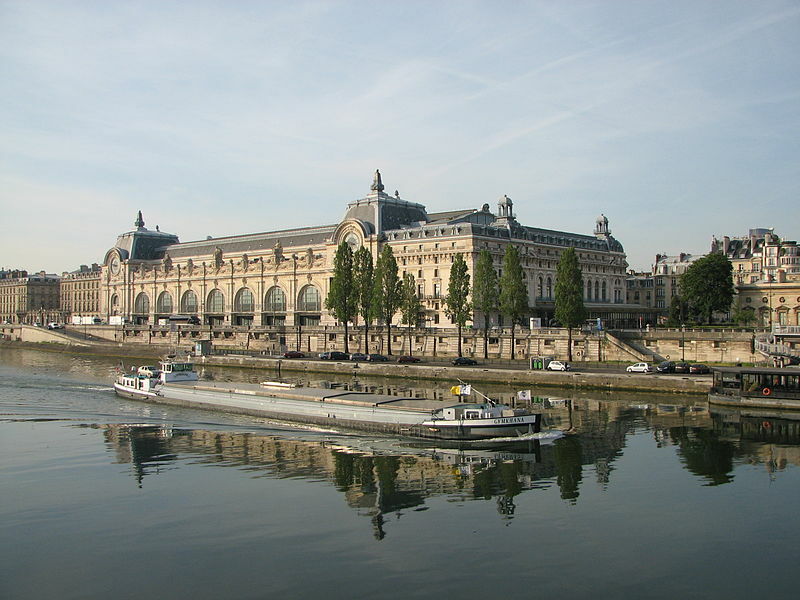 So the building itself could be seen as the first "work of art" in the Musee d'Orsay, which displays collections of art from the period 1848 to 1914. I loved everything about this beautiful museum from the building to the enormous amount of art from the Impressionist era. So many paintings I have only seen in books were on display: Monet, Van Gogh, Manet, Cezanne, Seurat, Caillebotte and Renoir just to name a few. No pictures are allowed in the museum but I did take a couple with my iPhone and no flash before I read the sign. 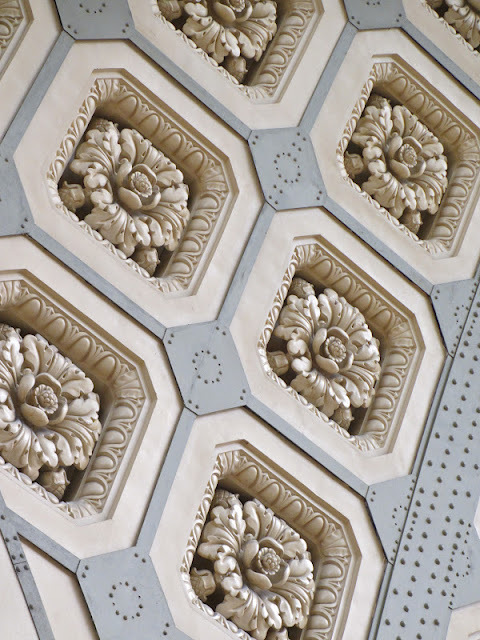 The museum website has a short 3 minute video that shows what the space looked liked as a railway station, the building of the new interior, and the installation of the art into the new space. It also shows the giant clock from the outside and many of the sculptures including a few of Degas' ballerinas which are fabulous. You can view it here. Can you believe this building was slated for demolition at one time? They had a few artists in the main Impressionist gallery copying actual paintings. 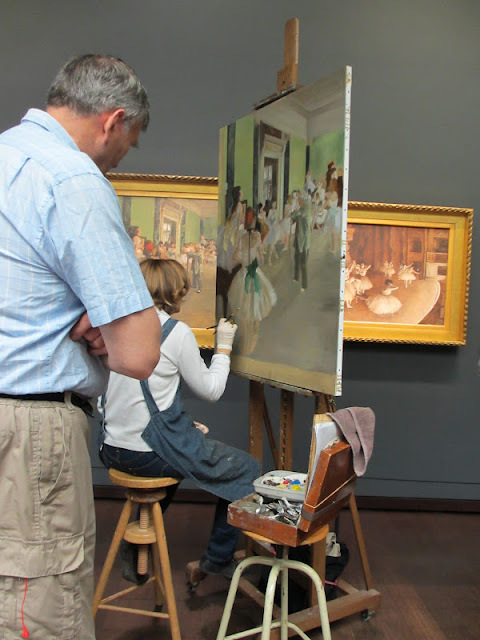 You can see she is working on Degas', The Dance Class and the real painting hanging on the wall. 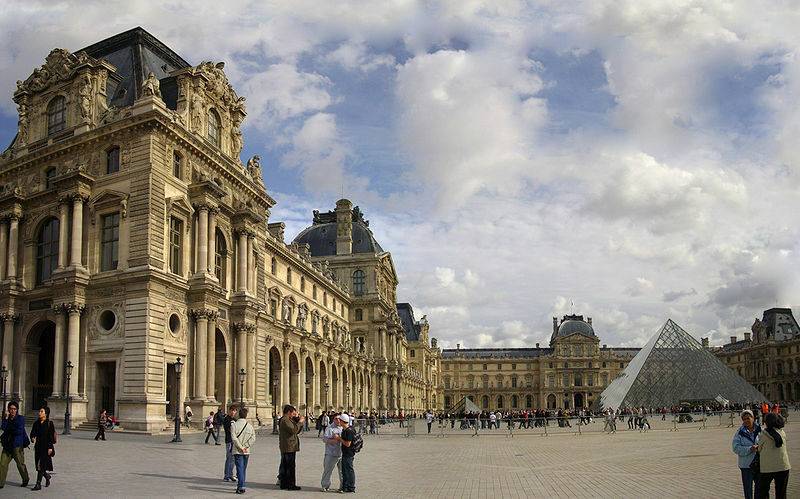 You can look out the giant clock and see across the Seine to see one corner of the Louvre. We had lunch at the restaurant in the museum...a bit pricey (but what isnt?) 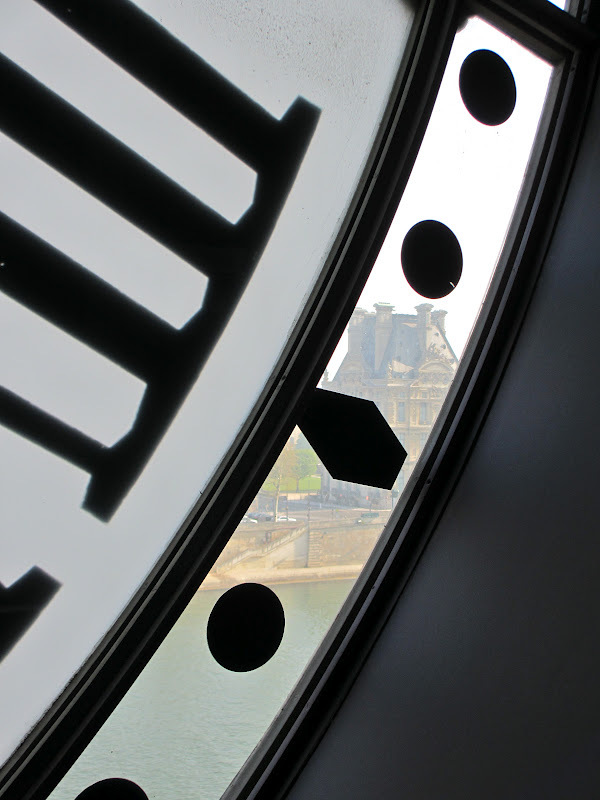 although fabulous decor and yet another clock that faces the Seine made it totally worth it. If you visit the museum you can purchase your tickets online before you go and avoid the lines. I recommend getting there when the museum opens at 9:30am (closed on Mondays). If you are taking the Metro, the museum is a short walk from the line 12, Solférino stop. 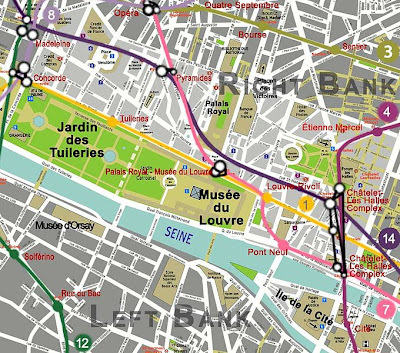 You can see by the map below how close the Musee d'Orsay and the Louvre are. 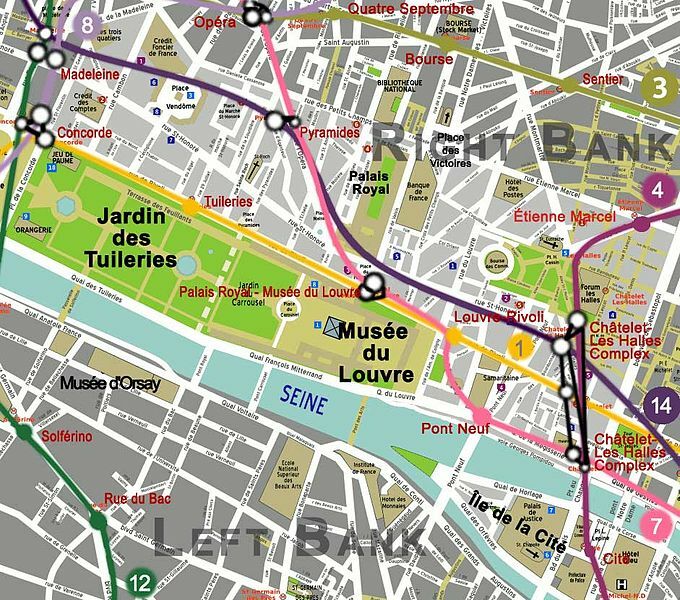 A good map is key for getting around Paris (or a good tour director). Barnes and Noble have nice laminated ones that have the city on one side and the metro system on the other. The Louvre began as a fortress (you can still see part of it in the basement) and then was a royal residence until Louis XIV decided to move outside the city to Versailles along with his court. 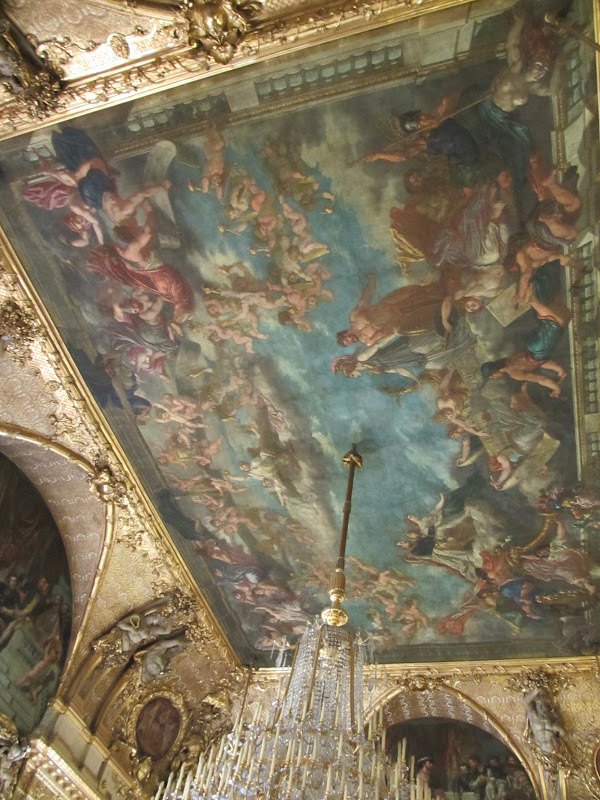 He still used the building to store his private art collection, as did his successors. 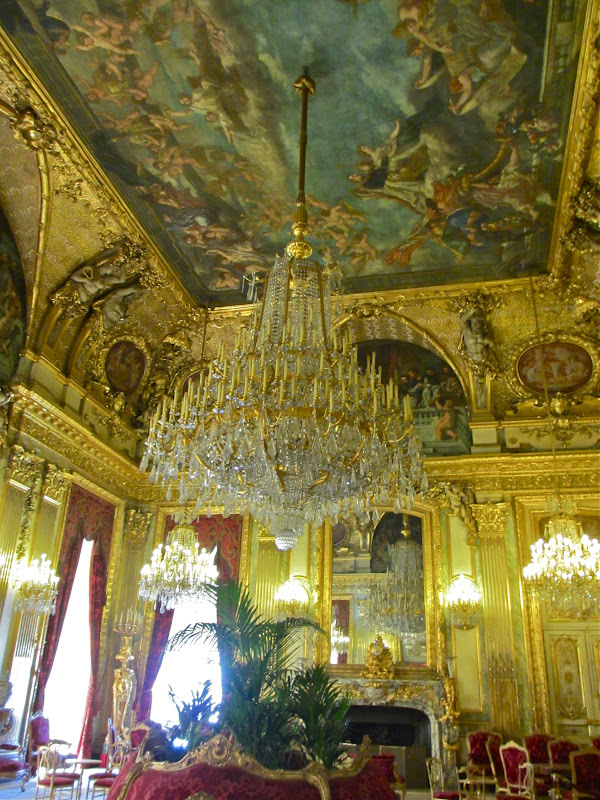 It was not until the French Revolution that the Louvre became a museum open to the public. 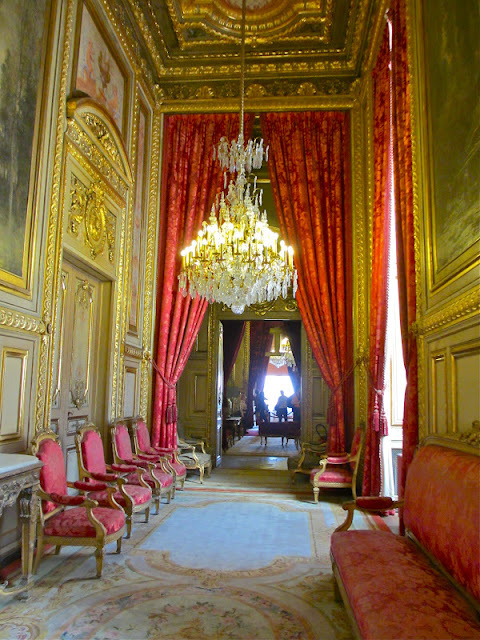 Not only is the Louvre one of the worlds largest museums, Napoleon III, who became Emperor of France in 1852, had a lavish apartment there which you can still visit today. After a few hours of attempting to take in a small part of the Louvre collection we wandered into this jewel box. I cannot even begin to describe how big and how beautiful the main chandelier is. Absolutely breathtaking. This picture does not even begin to do it justice. 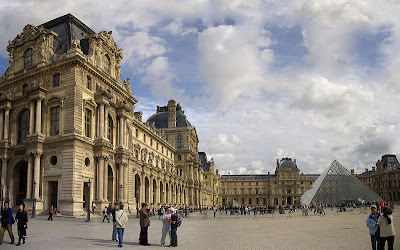 The nearest metro stop is Palais Royal-Musee du Louvre (Line 1). 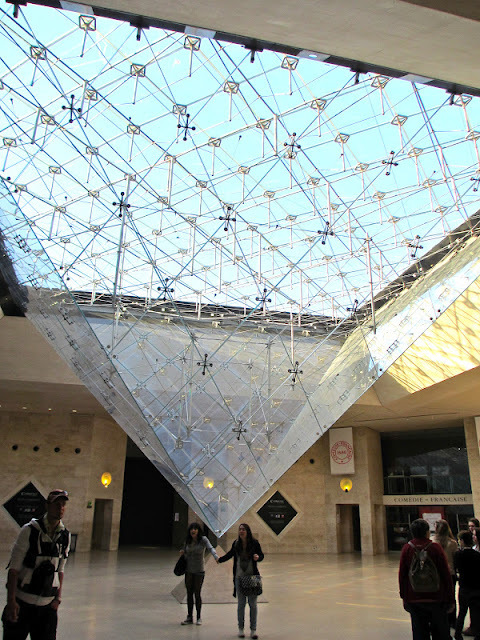 This line connects to a small mall that contains a famous skylight, the La Pyramide Inversee (the inverted pyramid), which plays an important role in the best-selling book The Da Vinci Code. I recommend lunch at Paul cafe right across from the Apple store. A great salad, drink and a dessert for about 12 Euros, plus a place to sit a relax your feet. It is best to get to the Louve before opening to avoid lines...with more than 15,000 visitors a day it is going to be busy no matter when you go. 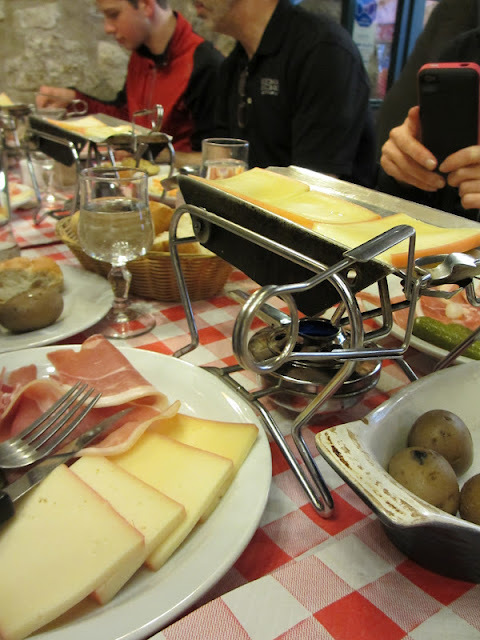 A group of us went for Raclette. Then walked a short distance to Notre Dame. Once we were done seeing Notre Dame, we walked along the Seine to one of the "Lock" bridges. 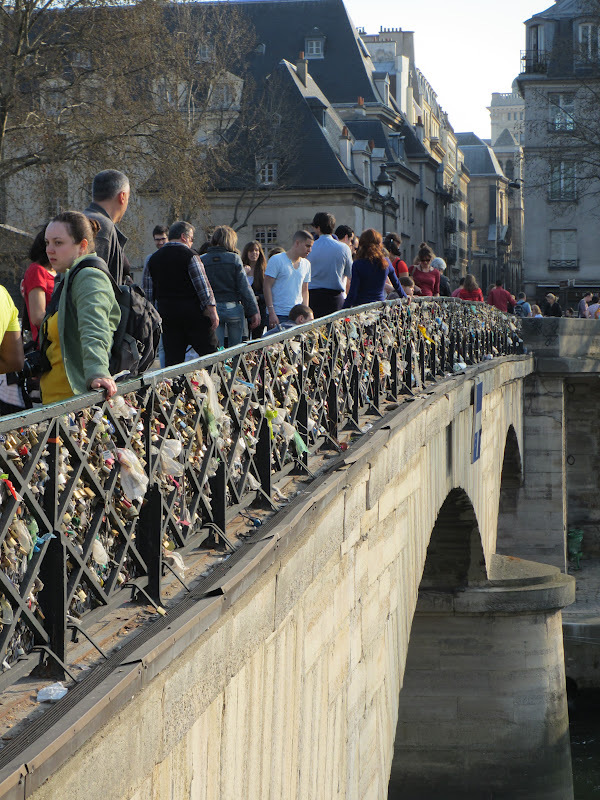 Thousands professing love by adding a "lock" to the bridge. Which leads into the Latin Quarter near the Sorbonne, the first great Parisian University. The area gets its name from the Latin language, which was once widely spoken in and around the University since Latin was the international language of learning in the Middle ages. We found a little bistro that served Raclette. 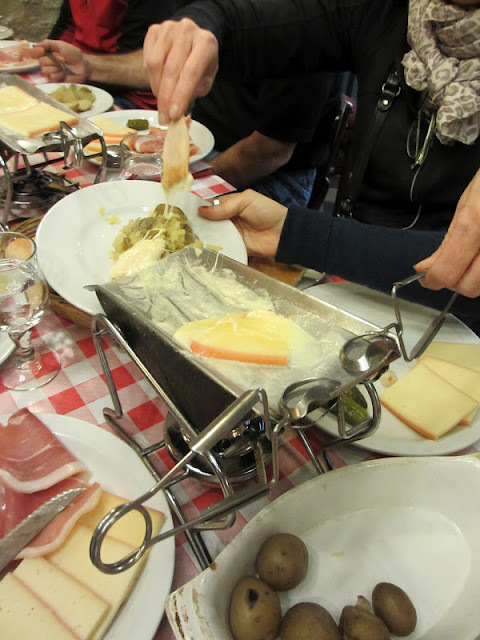 Each person is served Raclette cheese and thin sliced country ham and a pickle (I ate mine). Crusty french bread and small boiled potatoes are served family style. Metal melting plates with Sterno underneath for heat were placed on the table. Each person could place a piece of cheese on the metal plate (for lack of a better word) and wait for the cheese to melt. While it melts you cut up the ham and potatoes on your own plate then tip the metal plate and scrape off the melted cheese onto the potatoes and ham with a little spatula. What a fun dinner...very interactive since you had to watch the cheese and get ready at the same time. Now a walk back to the metro stop near by...a great end of the day. I hear they have Raclette grills at Bed, Bath & Beyond but I have not checked it out personally. I think the Raclette cheese is expensive and hard to find but maybe there is an alternative that might work in its place. Next week we'll talk flea markets and show you what I got. Right now it's still packed up but the laundry needs to come first. It was great to read you and see your beautiful pictures! thanks for this tour of Paris!! you can grill meat on top which is great, too, because only cheese, that is really stuffing! Did you know that the Musee d'Orsay was also the setting for the movie Hugo? It's depicted as the train station in the movie. I feel madly in love with it too when I visited! Thank you for the photos - they bring happy memories! I've always wanted to visit Paris. Thanks so much for sharing your beautiful pictures. What a beautiful city. I can't wait to go someday. It's definitely on my "bucket list". I bet the flea markets were incredible! Can't wait to see what you got. Thank you for the divine tour. Can't wait for the next chapter. Welcome home! Thanks for the pictures and description of your trip. Looks so beautiful. Thanks for a trip down Memory Lane! 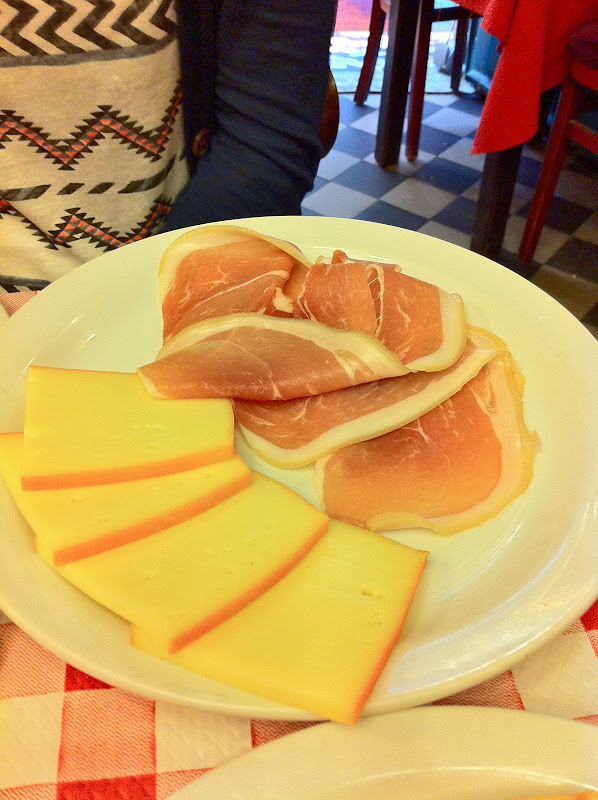 My daughter & I enjoyed Raclette at the Borough Market in London - the most amazing outdoor meal ever! Somehow I don't think it would taste the same here in the US. Paris is on my bucket list. The Raclette looks yumalicious! I think your next adventure should be to St. Petersburg FLORIDA (not Russia! )Whim So Doodle has such a nice ring to it in the summer, or even fall! How wonderful, Paula. Thanks for sharing these stories. Can't wait to hear about your flea market finds. Sandy posted a cute picture of you on the 7g blog at the flea market. Looks like it was a blast. 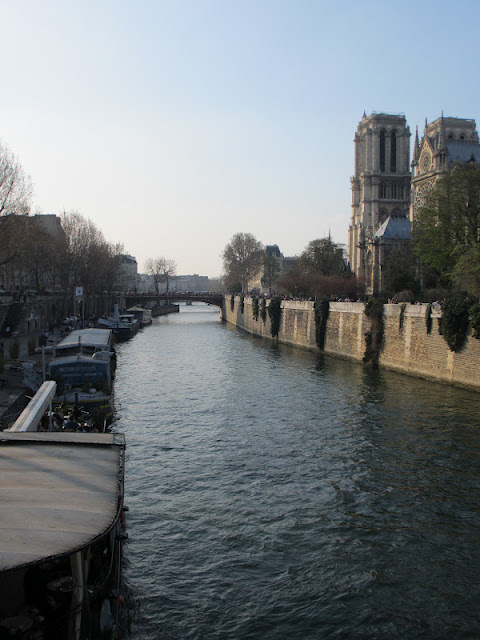 Paula - thank you for your fantastic photos and helpful information about Paris! Did you know any French or did many people speak English? I do not speak French but some of the people with me did. When they were not around it did not seem to be a problem, many people speak English or could understand you. To be honest, the only person who was rude was the lady at Laduree (the famous macaroon shop). 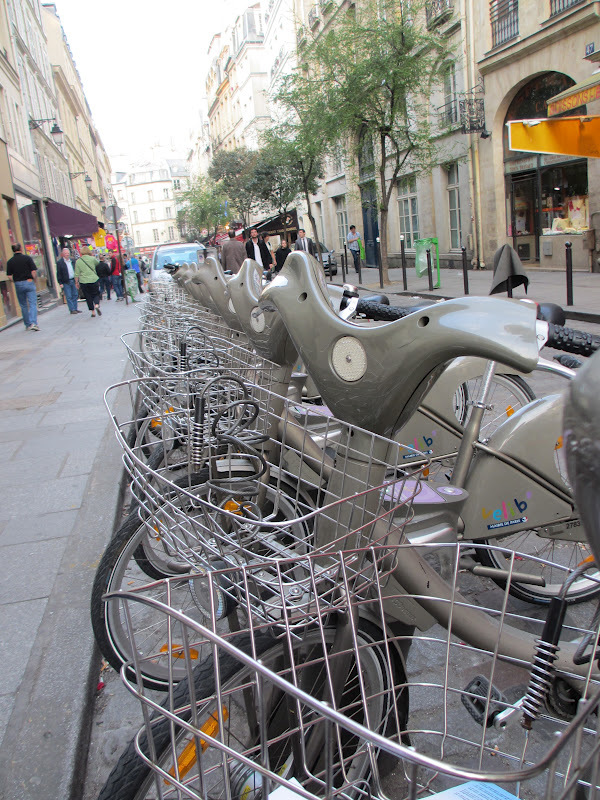 Next week post will include some tips when traveling in Paris so maybe that will give some insight. A wonderful blog read and thanks for the beautiful photos! Paris is on my list too; maybe some day!! Welcome home. Love your pictures, thanks for sharing with us. What a great trip it looks like you had! can't wait to read the next installment...great photos too! 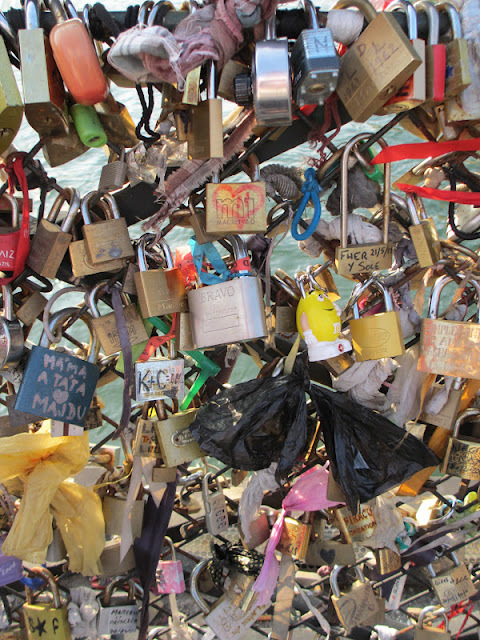 What a treat to see your pictures and read about some of your adventures in Paris! Can't wait for your post on the flea markets and the photos of your finds. Thanks for sharing!